J. Francis Macbride was born on 19 May 1892 in Rock Valley, Iowa. He received an A.B. 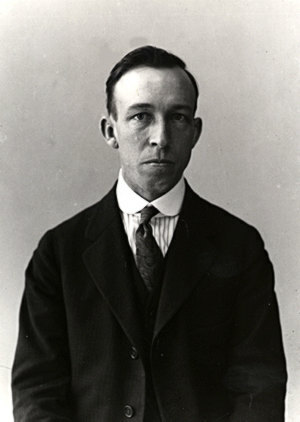 degree in 1914 from the University of Wyoming and briefly worked as an assistant at the Gray Herbarium at Harvard University. In 1921 he joined Field Museum's staff of the Department of Botany to head the newly created Flora of Peru program. Peru was selected as a center of floristic research by C. F. Millspaugh, the Museum's first Curator of Botany. In 1922, Macbride and a student assistant, William Featherstone, made the first of two expeditions to Peru. Traveling by steamboat via the Panama Canal, the journey to Peru from New York took nearly a month. Once in Peru, they collected in highland regions of the Departments of Lima, Junín, Huánuco, and Pasco. In the following year, Macbride returned to the Huánuco region and his collecting efforts descended into the upper Río Ucayali drainage. These expeditions yielded nearly 6,000 numbers and duplicates. For a decade beginning in August 1929, Macbride traveled to Europe to photograph type specimens of tropical American plants preserved in European herbaria. He visited all the major herbaria of the European continent including Copenhagen (C), Geneva (G, G-BOIS, G-DEL), Hamburg (HBG), Hannover (HAN), Madrid (MA), Munich (M), Paris (P), and Vienna (W). His efforts resulted in quality photographs of over 40,000 types and other historically important specimens. In Macbride's absence, the Museum continued to acquire Peruvian collections from various sources. In 1929, Mr. Llewelyn Williams, Assistant Curator of Economic Botany, made a year-long expedition to northeastern Peru and collected over 8,000 numbers. From 1924 to 1929 the Museum acquired additional Peruvian material from collectors, such as Drs. Agusto Weberbauer, F. W. Pennell, E.P. Killip, A.C. Smith, and G. Klug, amongst others. By 1936, the Field Museum's herbarium contained over 33,000 Peruvian specimens, the largest collection of Peruvian plants anywhere. The Flora of Peru was initiated in 1936 with the publication of the first number of Volume 13. The first volume contained an introduction to the phytogeography of Peru by Agusto Weberbaurer and family treatments for the gymnosperms and monocotyledons. Over the next quarter century, treatments for nearly 180 families were published in the Flora of Peru series and of these, Macbride personally treated 150. At the time of its conception, he considered the series as a pioneering contribution to the knowledge of the Peruvian flora. The format adopted was brief and no attempt was made to evaluate all species names, but all relevant literature was cited. Macbride designed the treatments to facilitate the determination of Peruvian plants and no comments on their relationships was included. In the late 1940's, Macbride relocated to California and used the facilities of the University of California and Stanford University to continue his work on the Flora of Peru. Macbride published his last family treatments in 1960, only 20 families left untreated in the series. He died on 16 June 1976 in Riverside, California and his obituary was published in Madroño 23: 456. 1976. The type photographs taken by Macbride in Europe were of immediate importance to North American botanists who lacked access to European herbaria and the critical type material they housed. However, the importance of this collection became even greater when during World War II, some European herbaria were damaged or destroyed by bombing. Due to Macbrides efforts, all the information relative to types at Berlin-Dahlem was not lost. For some species, the only known specimen is recorded among Field Museum's type photographs, and while not as useful as the original specimens, they often serve to resolve complex nomenclatural questions. Since 1939, additional photographs of types and historic specimens have been added to the collection and it now consists of nearly 70,000 negatives and accompanying collection data. A detailed account of the type photographs at the Field Museum was published by W. E. Grimé and T. Plowman, Taxon 35: 932-934. 1986. A selection of these black and white images have been scanned and associated with label information and annotation history. Some examples of Macbride's European Field Museum's Type Photographs may be accessed below.